At last I managed to find the missing Kefalonian photographs, after they were hiding in the loft for a large number of years. 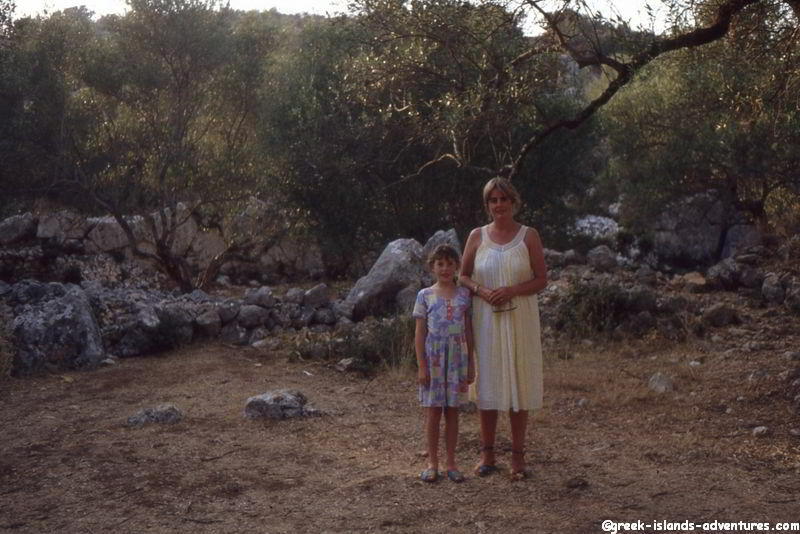 So now I can prove that we actually did go to Kefalonia, at least Mrs. S and Daughter did. You'll have to trust me that I was behind the camera. There follows a selection of the photos that I managed to find. The thumbnails might be a tad small to see any detail so if you fancy a closer look - click on any image to get a bigger version. Your browser back button will bring back to where you were. The Cyclopean Wall is a must see site. This is the track up to it and it can be seen just below the ridge in the middle of the picture. We got a bit closer to the wall, hiding in the trees here. 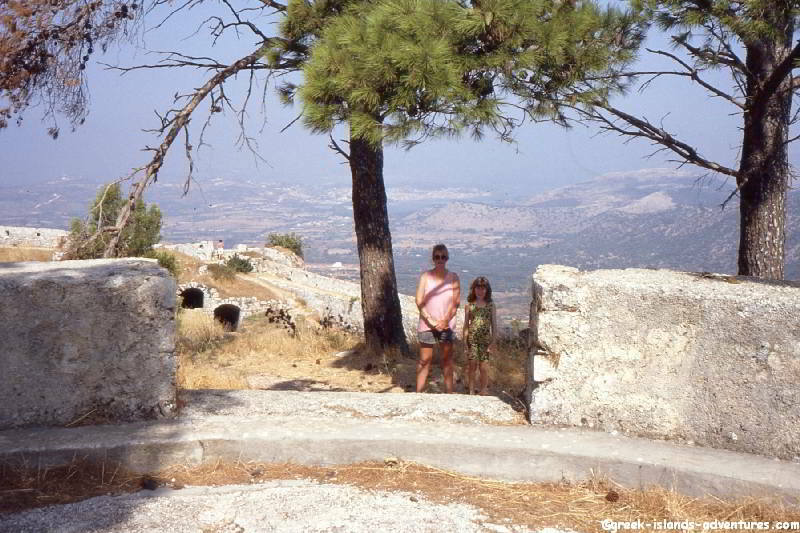 Just to prove that we were there, here is Mrs. S and Daughter, a boulder throw away from the wall. It felt a very isolated spot as it was not on a main tourist route but there are no access problems or restrictions. 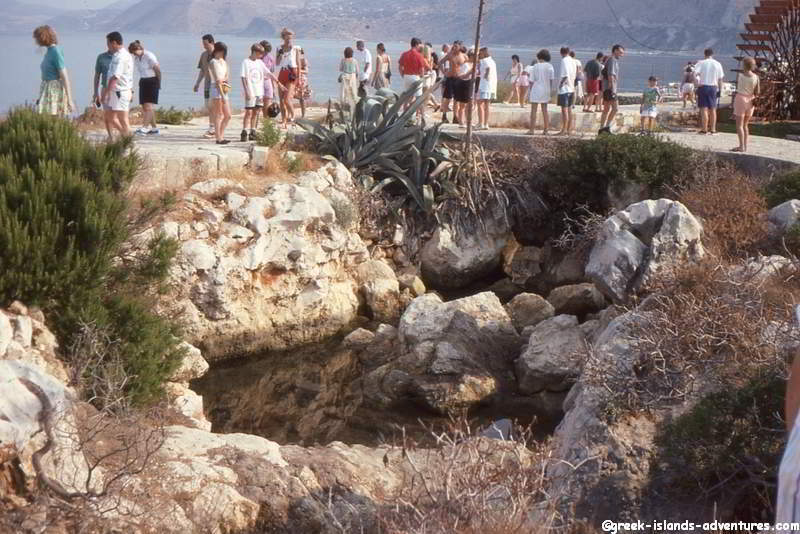 That is something we love about Greece, most historical sites around the islands are just left for you to explore. Vandalism just doesn't seem to be an issue. And as for Health and Safety ... that is best left at home. 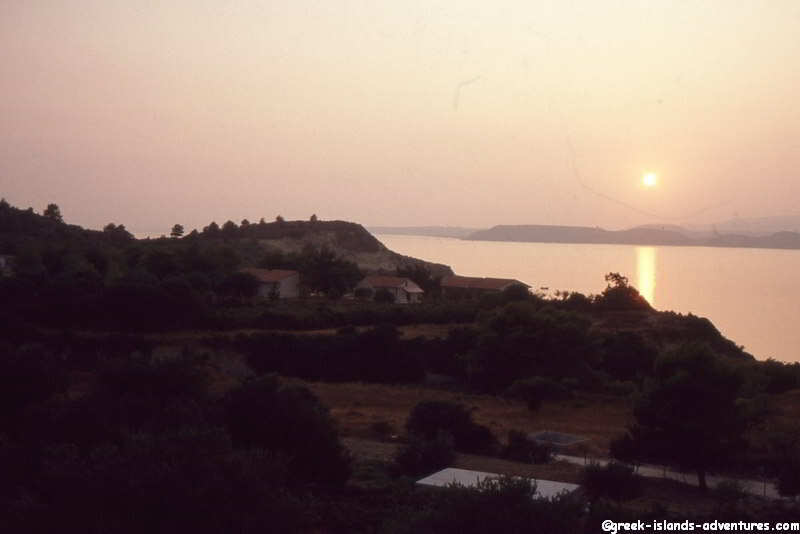 Another well known tourist destination is the Katavothres (Sea Mills) near Argostoli. It is at the upstream end of an unusual Geological feature. The sea water used to drive a water wheel (the one in the picture is a recent non-working replacement) and then disappear down this sink hole. 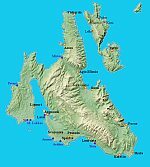 The water travelled under Kefalonia and popped out again near Sami on the other side of the island. Here is the 'Suitcase' car that we hired to tour Kefalonia. 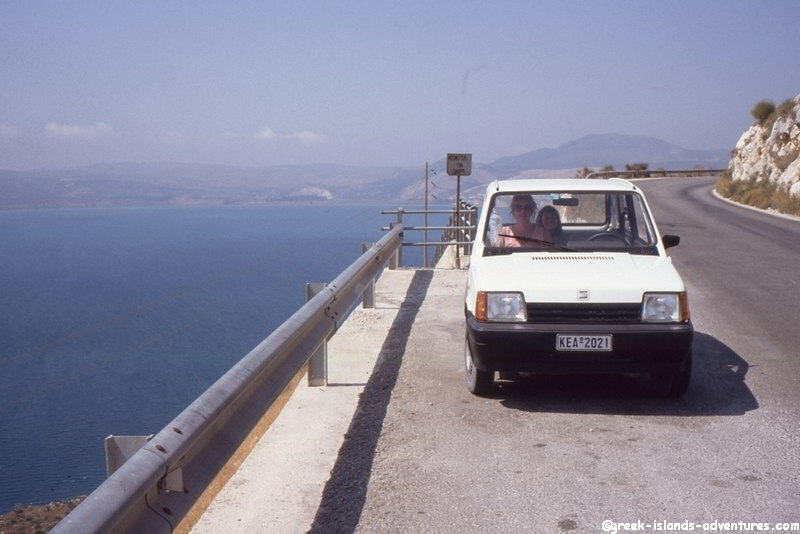 The little Fiat Pandas were very common in the Greek Islands back then and they always seemed to be used to perform the final transportation of suitcases from the package holiday airport coach to the allotted villas. It is amazing how many suitcases can be squeezed into a Panda. This particular one was called KEA by Daughter, for obvious reasons if you look at the bigger picture. 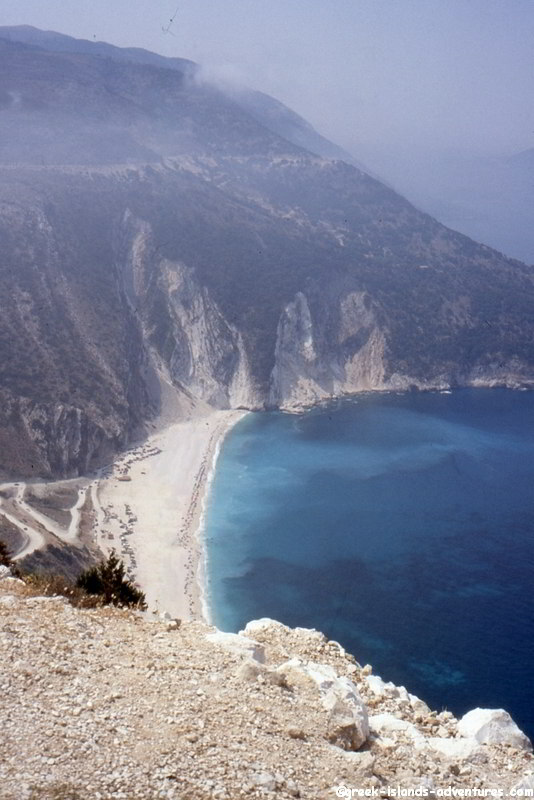 One trip in KEA was to visit Myrtos Beach. 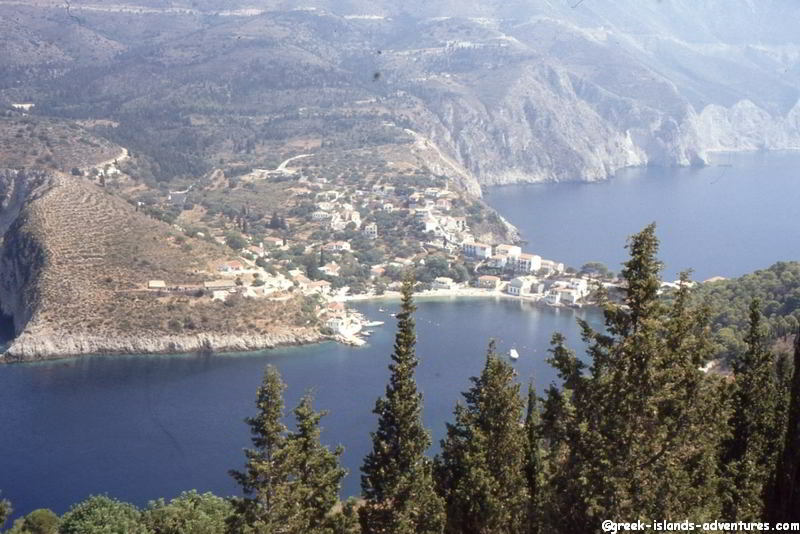 The view from above must be the most photographed view in the Ionian. 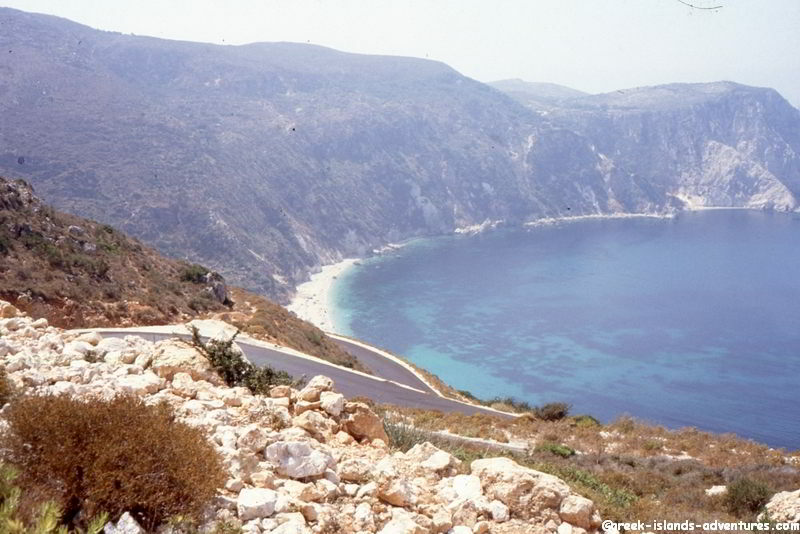 Then there is the hairpin road down which now has a tarmac surface so it is an easy, if twisty, drive. Once at the beach it is not as idyllic as it looks from above. It consists of large pebbles which were so hot that you could fry an egg. Not the most comfortable place we have been. 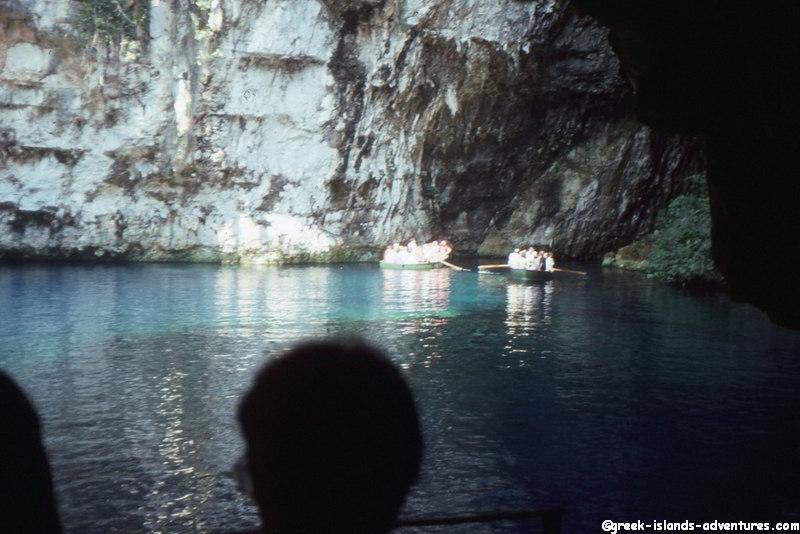 A much cooler location was Melissani underground lake. Here We are awaiting our turn to be rowed into the part of the cave which still has a roof. The water was incredibly clear and blue and it is a wonderful place to escape from the heat outside in the Summer. I wonder if it feels warm in the Winter? 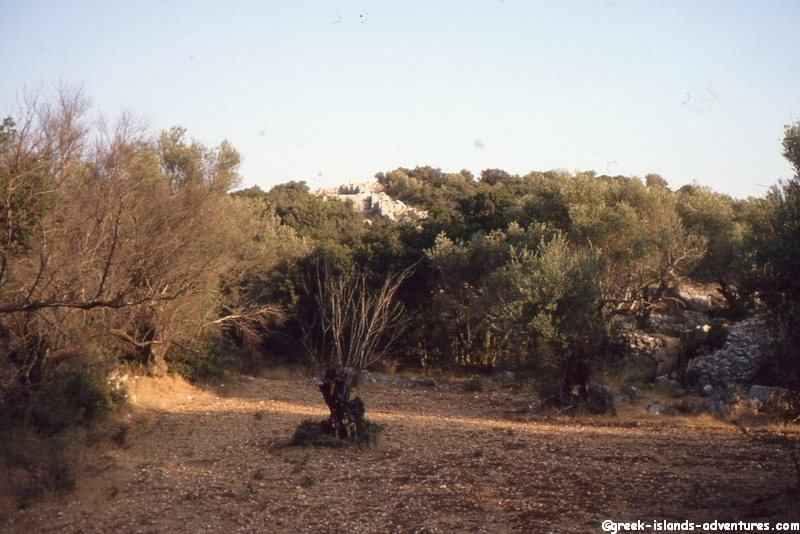 KEA also bravely navigated up a precarious, unfenced, hairpinned, mountain track to a Venetian fortress near Asos. With my assistance it was done Monte Carlo rally style much to the dismay of the passengers. Well ... I enjoyed it! And the view from the top was impressive. The picture is looking down to Asos which can be seen on the little strip of land, middle left of the picture. 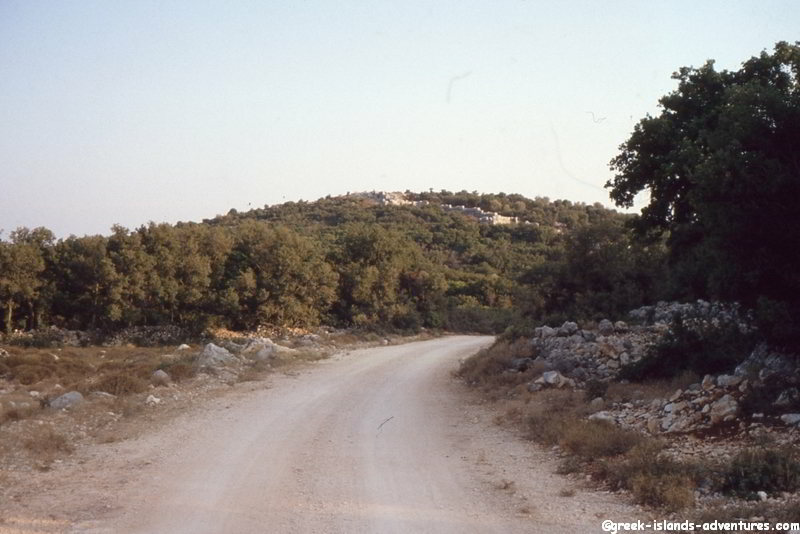 Another hairpinny trip was up to Kastro Agiou Georgiou in the south of Kefalonia. Again spectacular views around and plenty of old architecture to explore. No health and safety as before - bliss! 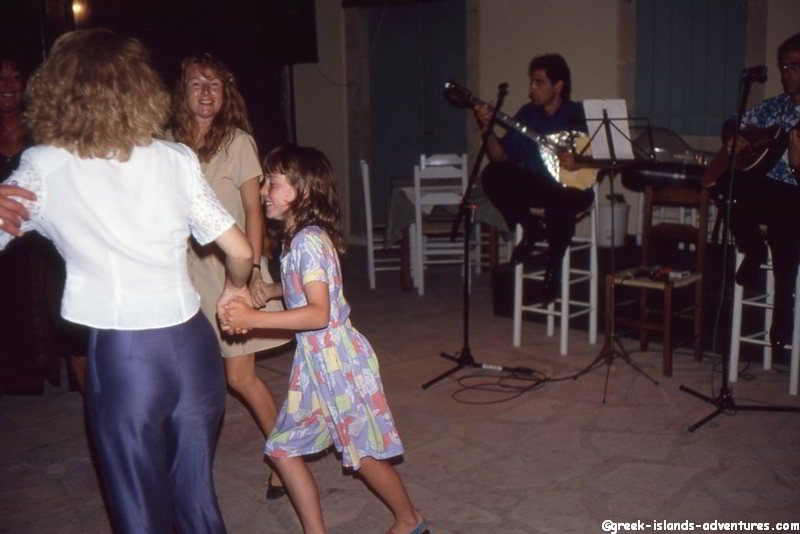 On a 'Greek Evening' tour, the taverna laid on copious quantities of 'free' wine and some Greek music and dancing. Here, Daughter is trying it out with the local holiday reps. I think that the Bouzouki players might have done it a few times too many looking at their expressions. When we weren't touring around, we spent the time on the local beach at Lassi. It was a downhill walk from the apartment which meant that coming back we were ready for our showers and cool drinks on the balcony. 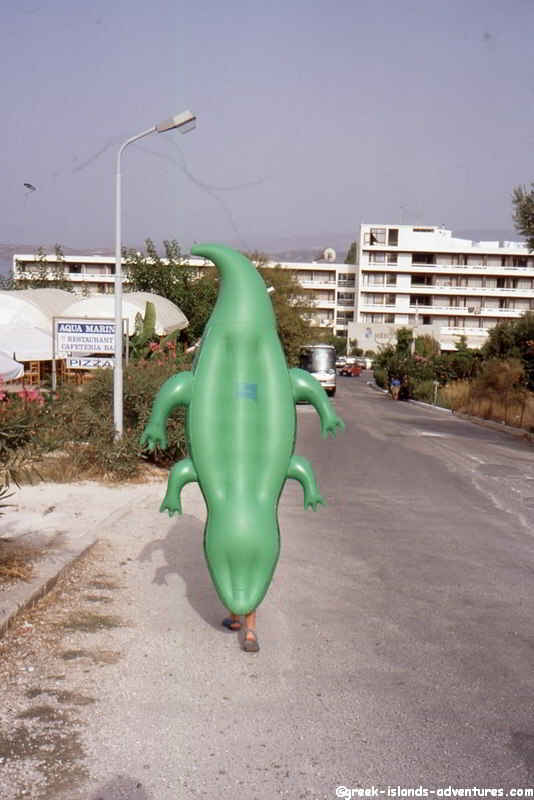 Invariably we were joined by the unusual inflatable green crocodile. As you can see it either has a strange way of walking or it has eaten (temporarily) the Daughter. It also illustrates the trek to the beach from our apartment. At least it was not as hot as the Halki hike. Crocodile Dundee, eat your heart out. 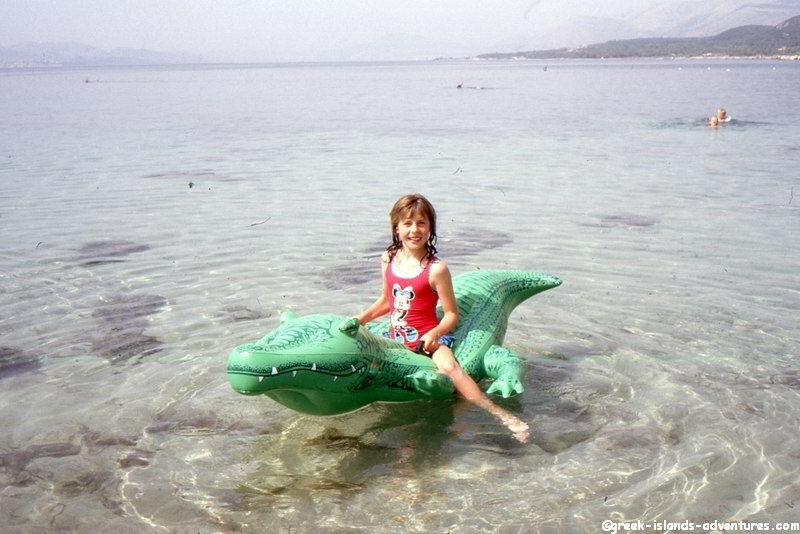 The ferocious inflatable crocodile was easily tamed by Daughter. She did have a bit of trouble when it got windy and the waves came though. But just look at that clear sea !! After a busy day relaxing we loved to visit our favourite bar on Lassi beach where the drinks were cooled in an environmentally friendly way by the sea. Here it is presented by young Daughter. The only drawback that we found was that we had to take our own drinks. But you couldn't beat the location. Sometimes to save another trek to Lassi beach we would just sit on our balcony and admire the stunning views. Especially of the sunset. A perfect way to end another perfect day.